We don’t really have much of an autumn season here in south Texas, but I like to read about the beautiful changing leaves and the crisp weather because I dream about what we’re missing. Autumn is my favorite season and I miss the scarlet leaves and the chilly mornings. So, I reminisce while we read some fun picture books to try to make it feel like fall. Whether you’re enjoying a beautiful autumn in your home state or simply dreaming about changing leaves and brisk winds, you can get in the spirit of autumn with some of our favorite picture books!! Are you reading any autumn books this season? More book lists and fun reading! Thanks for this!! So many cute and educational ones. We are always looking for new books. 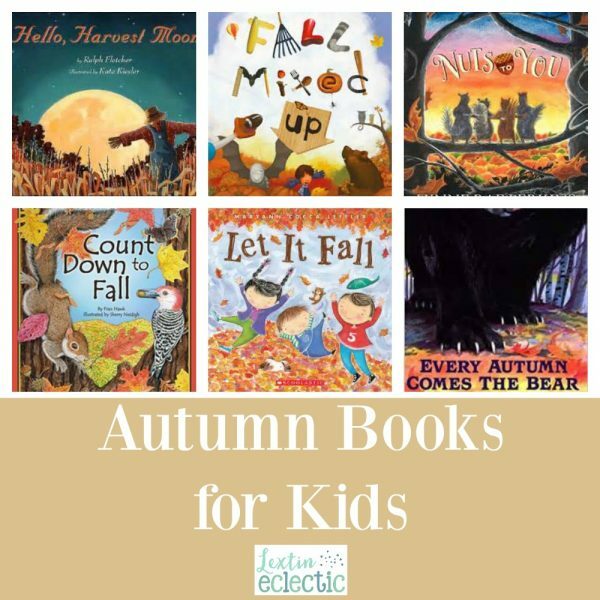 Great list of books – fall is my favorite season 🙂 Countdown to Fall is a favorite in our house! Ooooo as a Primary Teacher and a book lover I adore new recommendations and I’ve not heard of any of these little gems so thank you….amazon here I come! Lois Elhert is one of my favorite children’s authors, and I love Red Leaf, Yellow Leaf. Great list! Thanks for these great suggestions! My kids love books about the seasons! Love Fall so much! And these books are such good suggestions. Heading to the library with the kids next week to start reading fall books!